Score the fat and drizzle the lamb roast with olive oil, salt, and 2 cloves of sliced garlic. Rub well, cover, refrigerate. Prepare the mint sauce for cherries using the whole mint leaves, red wine vinegar, olive oil and salt and pepper. Use a mortar and pestle (or improvise) to bruise the mint with oil, vinegar, and spices. Refrigerate. Preheat BBQ on medium-high to 500 °F. Remove bits of garlic from the lamb, liberally season with salt and pepper. Lightly oil a skillet and brown each side of the roast over medium heat for about 2-3 minutes. Cover each of the bones with a strip of aluminum foil. Place roast on foil BBQ pan, (BBQ Buddy by Alcan) or in an oven-proof skillet. Roast on the BBQ, checking with an instant-read thermometer. (145° F for medium rare, 160 ° F for well done: 20-45 minutes.) Cover with foil, remove it to rest. While the lamb cooks, prep the Cherries…. Wash, dry, stem, and pit the cherries. Cut them into halves and toss them with the lemon juice, oil and sugar. Line a baking sheet with foil and oil it generously with olive or canola oil. Arrange the cherries, cut-side down, evenly to cover the baking sheet. Put the sheet of cherries on the BBQ as you remove the lamb. Roast them there for 10 minutes, longer if you want them more caramelized. Remove pan and turn the BBQ off. 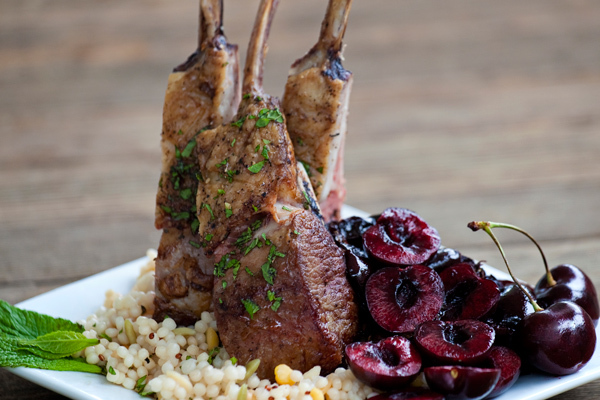 Toss the marinated mint sauce over the cherries; leave them on the open BBQ while you carve the rack of lamb. Suggested sides: Israeli cous cous , Orzo, or polenta.